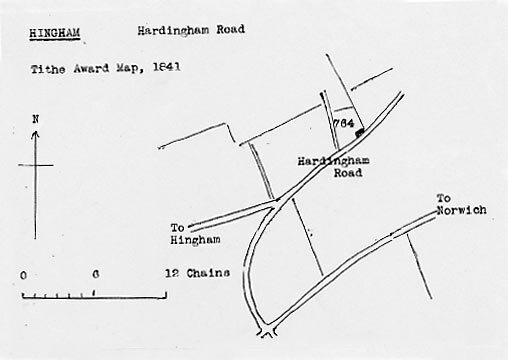 Hingham Mill Farm postmill on the Hardingham Road stood on an eight foot high mound. A DWELLING HOUSE with convenient offices & outhouses in good Repair & about 2 acres of Land thereto belonging in Hingham in the county of Norfolk. Also a WINDMILL which was lately put into substantial & compleat Repair & is now fit for Business. The Whole of the Premises are now in the Occupation of Mr. Joseph Doe. A Purchaser may enter thereon at Michaelmas next or sooner if required. Enquire of Mr. Algar of Old Buckenham in the said County. John Bilham late of Hingham, Miller, deceased. Capital Post Wind-Mill in full trade. A Capital POST WIND-MILL, with all the going geers & a substantial Freehold brick & tile MESSUAGE with convenient outbuildings & a large yard & garden. The premises are well, situated for trade, are very near the town of Hingham & are now in the occupation of Mr. Pinchen. Possession may be had on the 6th day of April next. Apply to the Auctioneer, Hingham. In HINGHAM ... one sail was blown off Fisher's Mill. A Messuage, Outbuildings, Barn, Stables & other Buildings, POST WINDMILL standing in an elevated postion together with 38 acres of valuable Land. All Freehold. Full particulars in future papers. To be Sold by Auction by Messrs. Standley & Sons at the White Hart, Hingham on Tuesday 10 September 1872 at 4 for 5 o'c. LOT 1. A brick & Tiled Dwelling House with convenient offices, POST WINDMILL, Barn, Stables, Granary, Yard, Garden & a small Paddock of Pasture Land. Particulars of Mr. Henry Feltham, Solr. Hingham & of the Auctioneers, Wymondham. To be Sold by Private Contract, a Freehold Residence, Post Windmill, Granary & Agricultural Buildings & about 40 acres of valuable land. This property will be Sold either in one lot or several lots. Apply to Mr. Henry Feltham, Solr. Hingham. In 1938 Harry Haylock bought Mill Farm. There was no mill then, just a granary next to the eight foot mound. The top story of the granary was in poor condition, so he took it down to one storey and thatched the roof since tin was in short supply due to outbreak of WW2. The building was then used to fatten cattle. Harry's son Norman pulled down the building around 1968, replacing it with a workshop and garage. The top two or three feet of the mound was levelled to accomodate a bungalow in 1964. After Harry Haylock died in 1998, Norman pulled down the Mill cottage that he lived in and landscaped the land. The topsoil was pushed back up to the original height of the mound and a thatched gazebo now sits on the site of the mill with a waterfall flowing down into a pond.